Because incorrect installation can lead to compromised performance for any type of insulation, it is critical to carefully follow installation protocols for any product. A few examples of important steps in the installation process, focused on fiber glass, cellulose, and spray foam insulation, are given below. To achieve the tested R-value, batt insulation must be carefully fitted so that it touches all sides of a cavity, leaves no gaps, and is not compressed. While blown fiber glass or cellulose can make it easier to entirely fill cavities, settling may be an issue. In horizontal installation, loose cellulose settles a small amount over time, so the installed thickness must be adjusted to account for this. In dense-pack applications for fiber glass and cellulose, variations in installation techniques or installed density can lead to variations in R-value and airflow reduction, or to settling over time that can create gaps in the insulation. Because spray foam insulation is manufactured on site as it is installed, several variables can affect performance, such as proper mix ratio, ambient temperature and humidity, substrate cleanliness, thickness of a single pass, and overall installed thickness. Problems such as cracks, blowholes in the foam, shrinkage away from the framing, or even scorching within the foam due to excessive heat given off by the chemical reaction have all been observed.Cracks, holes, or gaps formed during installation may be difficult to detect and can compromise the R-value and air-sealing properties if they are not remedied. There can also be significant nonuniformity in an application.Improper installation can lead to gummy or brittle foam, as well as lingering odors, which are both performance and health concerns. Proper installation is also key to protecting installer and resident safety. Most product literature suggests the use of certain personal protective equipment (PPE) when installing different insulation products, but the level of required PPE varies widely among different types of insulation, as noted below. For installation of fiber glass insulation, skin protection (long sleeves, long pants, and gloves), eye protection, and a dust respirator are recommended. Similar recommendations are made for cellulose insulation. In contrast, required PPE for spray foam installation usually includes full body protection in the form of disposable coveralls, chemical-resistant gloves and boots or booties, a hood, and eye and face protection as well as supplied air respirators. Spray foam insulation reacts on site, and hazardous chemicals are given off during this process. Respiratory impacts from isocyanate exposure can come not just from breathing in vapors, but also from skin contact with the chemicals. Spills or leaks and cleaning processes present potential for additional exposure, as does the presence of unreacted isocyanates in dust created during trimming. Excessive heat release can also lead to fires in extreme cases. This post was adapted from Making Affordable Multifamily Housing More Energy Efficient: A Guide to Healthier Upgrade Materials. Find out more about the performance characteristics of different insulation materials, their relative cost, and their content and associated health hazards in the full report. Learn more about hazards throughout the life cycle of spray foam insulation in our webinar recording and follow up Q&A, featuring HBN researchers and Greg Siwinski, certified industrial hygienist with the Occupational Health Clinical Center (SUNY Upstate Medical University). In line with their goal to “reduce human and environmental exposures to toxic chemicals in consumer products,” CA DTSC listed Spray Polyurethane Foam Systems with Unreacted Methylene Diphenyl Diisocyanates as a Priority Product in July of this year. See their announcement about this regulation for more information. Henderson, Shawna. “The Consequences of Improperly Installed Batt Insulation.” SBC Magazine, March 6, 2017.http://www.sbcmag.info/news/2017/mar/consequences-improperly-installed-batt-insulation. ; “Home Insulation: Achieving Grade 1 Installation.” Insulation Institute, Accessed March 31, 2017. http://insulationinstitute.org/im-a-building-or-facility-professional/residential/installation-guidance-2/grade-1-installation/. “Standard Practice for Installing Cellulose Building Insulation.” Technical Bulletin. The Cellulose Insulation Manufacturers Association (CIMA), n.d. http://www.cellulose.org/userdocs/CIMA-TechnicalBulletin02.pdf. ; “Settling The Myth About Cellulose Insulation Settling.” Cellulose Insulation Manufacturers Association, February 19, 2016.http://cellulose.org/GreenestInsulation/2016/02/19/settling-the-myth-about-cellulose-insulation-settling/. ; Schumacher, C.J., M.J. Fox, and J. Lstiburek. “Airflow Resistance of Loose-Fill Mineral Fiber Insulations in Retrofit Applications.” US Department of Energy, Energy Efficiency & Renewable Energy, February 2015.http://www.nrel.gov/docs/fy15osti/63081.pdf. Knowles, Mason. “Troubleshooting Spray-Foam Insulation.” The Journal of Light Construction, September 2010.http://www.jlconline.com/how-to/insulation/troubleshooting-spray-foam-insulation_o. Foam Fails Reason #5: Excessive Shrinkage.” 475 High Performance Building Supply Blog, October 8, 2014.https://foursevenfive.com/foam-fails-reason-5-excessive-shrinkage/. ; Kaye, Jamie. “GUEST POST: Spray Foam, Infrared Cameras, & the New Big Holes.” The Energy Vanguard Blog, March 21, 2012.http://www.energyvanguard.com/blog/52381/GUEST-POST-Spray-Foam-Infrared-Cameras-the-New-Big-Holes. Poppendieck, Dustin G., Mengyan Gong, and Lauren E. Lawson. “Lessons Learned from Spray Polyurethane Foam Emission Testing Using Micro-Chambers.” In The 59th Annual Polyurethanes Technical Conference. Baltimore, MD, 2016. http://ws680.nist.gov/publication/get_pdf.cfm?pub_id=921259. Knowles, Mason. “Troubleshooting Spray-Foam Insulation.” The Journal of Light Construction, September 2010.http://www.jlconline.com/how-to/insulation/troubleshooting-spray-foam-insulation_o. ; “Staff Review of Five Amine Catalysts in Spray Polyurethane Foam.” Status Report. United States Consumer Product Safety Commission, September 19, 2012. https://www.cpsc.gov/PageFiles/129845/amine.pdf. “Technical Bulletin #78: Recommended Fiber Glass Installation Guidelines.” CertainTeed Corporation, October 29, 2007. https://www.certainteed.com/resources/TB__78_-_Recommended_Fiber_Glass_Installation_Guidelines.pdf. ; “Working Smart with Fiber Glass, Rock Wool and Slag Wool Products: Recommended Work Practices for the Installation of Synthetic Vitreous Fibers (SVF).” North American Insulation Manufacturers Association (NAIMA), October 2003.http://insulationinstitute.org/wp-content/uploads/2016/02/N027.pdf. McCleery, Robert E., Joel McCullough, Ronald M. Hall, and Joseph E. Fernback. “NIOSH Exposure Assessment of Cellulose Insulation Applicators.” Health Hazard Evaluation (HHE). National Institute for Occupational Safety and Health (NIOSH), March 2001. https://www.cdc.gov/niosh/hhe/reports/pdfs/2000-0332-2827.pdf. ; GreenFiber, Cellulose Insulation, Loose Fill Borate Formula (Safety Data Sheet), May 2015, http://www.greenfiber.com/wp-content/uploads/2016/10/MSDS-Loose-Fill-Borate-Formula.pdf. US EPA, OCSPP. “Spray Polyurethane Foam Product Types.” Overviews and Factsheets. Accessed March 30, 2017.https://www.epa.gov/saferchoice/spray-polyurethane-foam-product-types. ; “Health and Safety Practices for SPF Applications.” OSHA, Accessed May 4, 2017. https://www.osha.gov/dte/grant_materials/fy10/sh-21003-10/manual.pdf. US EPA, OCSPP. “Health Concerns about Spray Polyurethane Foam.” Overviews and Factsheets. Accessed February 6, 2017. https://www.epa.gov/saferchoice/health-concerns-about-spray-polyurethane-foam. ; Guo, Dennis Fengmao, Lynn Nakayama Wong, Valerie Hanley, Julia Gress, and Jesse Schnell. “Summary of Technical Information and Scientific Conclusions for Designating Spray Polyurethane Foam Systems with Unreacted Methylene Diphenyl Diisocyanates as a Priority Product.” Safer Products and Workplaces Program. Department of Toxic Substances Control - California Environmental Protection Agency, February 2017. http://www.dtsc.ca.gov/SCP/upload/SPF-Systems-Summary-of-Technical-Information.pdf. Guo, Dennis Fengmao, Lynn Nakayama Wong, Valerie Hanley, Julia Gress, and Jesse Schnell. “Summary of Technical Information and Scientific Conclusions for Designating Spray Polyurethane Foam Systems with Unreacted Methylene Diphenyl Diisocyanates as a Priority Product.” Safer Products and Workplaces Program. Department of Toxic Substances Control - California Environmental Protection Agency, February 2017.http://www.dtsc.ca.gov/SCP/upload/SPF-Systems-Summary-of-Technical-Information.pdf. ; US EPA, OCSPP. “Potential Chemical Exposures From Spray Polyurethane Foam.” Overviews and Factsheets. Accessed March 30, 2017.https://www.epa.gov/saferchoice/potential-chemical-exposures-spray-polyurethane-foam. Gouveia, Aaron. “‘Green’ Insulation Suspected as Cause of Fatal Fire.” Cape Cod Times. May 20, 2008.https://web.archive.org/web/20130131034138/http://www.capecodonline.com:80/apps/pbcs.dll/article?AID=/20080520/NEWS/805200318/-1/rss01. ; Holladay, Martin. “Three Massachusetts Home Fires Linked to Spray-Foam Installation.” Green Building News, August 16, 2011. http://www.greenbuildingadvisor.com/blogs/dept/green-building-news/three-massachusetts-home-fires-linked-spray-foam-installation. ; “Spontaneous Combustion of Insulation Blamed in Stella’s Fire.” CBC News, October 8, 2015.http://www.cbc.ca/news/canada/manitoba/spontaneous-combustion-of-insulation-blamed-in-stella-s-fire-1.3263923. ; Bogstie, Debra. “Homeowner Moves On After Devastating Middlebury Fire.” NBC Connecticut, July 14, 2014.http://www.nbcconnecticut.com/news/local/Homeowner-Moves-On-After-Devastating-Fire-267070781.html. “SPF Insulation Is Energy-Efficient, but Is It Safe for Workers?” California’s Worker Occupational Safety and Health Training and Education Program (WOSHTEP) and Labor Occupational Health Program (LOHP) UC Berkeley, 2013. https://www.dir.ca.gov/chswc/WOSHTEP/Publications/Spray_Polyurethane.pdf. ; US Environmental Protection Agency. “Vacate and Safe Re-Entry Time for Spray Polyurethane Foam Application.” Overviews and Factsheets. Accessed March 7, 2017. https://www.epa.gov/saferchoice/vacate-and-safe-re-entry-time-spray-polyurethane-foam-application. US EPA, OCSPP. “Quick Safety Tips for Spray Polyurethane Foam Users.” Overviews and Factsheets. Accessed March 30, 2017. https://www.epa.gov/saferchoice/quick-safety-tips-spray-polyurethane-foam-users. Guo, Dennis Fengmao, Lynn Nakayama Wong, Valerie Hanley, Julia Gress, and Jesse Schnell. “Summary of Technical Information and Scientific Conclusions for Designating Spray Polyurethane Foam Systems with Unreacted Methylene Diphenyl Diisocyanates as a Priority Product.” Safer Products and Workplaces Program. Department of Toxic Substances Control - California Environmental Protection Agency, February 2017.http://www.dtsc.ca.gov/SCP/upload/SPF-Systems-Summary-of-Technical-Information.pdf. Lax, Michael, Greg Siwinski, and Dorothy Wigmore. “Comments on Green Seal GS-54 Proposed Standard.” Occupational Health Clinical Centers, March 2016.; “Attachment for Comments about SG-54: OHCC Experiences with Isocyanate Foam Insulation Episodes as of December, 2015,” March 2016. 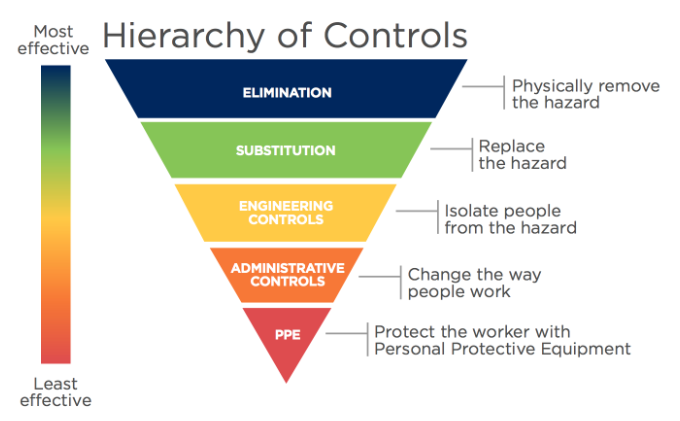 “Hierarchy of Controls.” NIOSH Workplace Safety & Health Topics, July 18, 2016.https://www.cdc.gov/niosh/topics/hierarchy/. ; Guo, Dennis Fengmao, Lynn Nakayama Wong, Valerie Hanley, Julia Gress, and Jesse Schnell. “Summary of Technical Information and Scientific Conclusions for Designating Spray Polyurethane Foam Systems with Unreacted Methylene Diphenyl Diisocyanates as a Priority Product.” Safer Products and Workplaces Program. Department of Toxic Substances Control - California Environmental Protection Agency, February 2017. http://www.dtsc.ca.gov/SCP/upload/SPF-Systems-Summary-of-Technical-Information.pdf.